What do America’s shopping malls have to do with health? Surprisingly and increasingly, quite a bit. Picture over 200 people arriving on an early weekday morning at a local shopping mall to get in as many walking steps as possible as a result of participating in organized mall walking programs. With the advent of technology and repurposing of malls, especially as experts say that as much as a third of malls are dying across the United States, using shopping centers to exercise is a promising activity that has been growing in the United States, and New Jersey has been quick to jump on the bandwagon. Last year, the University of Washington’s Health Promotion and Research Center (HPRC) collaborated with the Center for Disease Control (CDC) to launch Mall Walking: A Program Resource Guide. HPRC performs research to advance the health and well-being of middle-aged and older adults, focusing on low-income and underserved populations who also have some of the highest health disparities. Through the resource guide, HPRC delineates specific recommendations to establish successful mall walking programs. The guide includes examples of mall walking programs in the United States that have already produced fruitful results. Significant factors burgeoning mall walking programs should consider include turning to lessons learned and best practices from established programs, partnering with mall managers, hiring support staff, identifying strategic partnerships with community-based organizations, offering transportation services to and from the mall site, carefully planning the programmatic components of the mall program, considering the characteristics of the surrounding communities for integration purposes, incorporating safety precautions, plan for program costs, marketing techniques to recruit and retain participants, and conduct program evaluation. The Willowbrook Mall also houses the New Vitality Mall Walkers Program, which is sponsored by the Chilton Memorial Hospital. Kathy Ferrara, the New Vitality Health Educator at the hospital said, “The mall was [initially] working on another project with the hospital, and learned about the New Vitality program (health and wellness for adults 65 and older). They were very interested in forming a partnership with us that would bring our members to the mall and also bring some health services (we used to have health programs and mini health fairs at the mall as part of the walkers program). They [mall management] provide a safe walking space for seniors where they could walk all year regardless of the weather.” Similar to the HealthHike Walking, the New Vitality program also integrates guest speakers, incentives and refreshments during participant monthly meetings. “I go to the mall on the second Wednesday of the month with granola bars and water and a speaker on a health topic and collect their walking logs,” said Ferrara. “The walkers keep track of their miles walked for the month. They receive incentive prizes at certain point of mileage.” In fact, the New Vitality Mall Walkers Program now counts 350 registered participants, and about thirty to forty walk on a regular basis. Mall Walkers reach end of mall walking event. According to an article published in Walking Magazine, mall walking programs can be traced as far back as 1985, and as a result large numbers of mall walkers across the nation’s shopping malls have garnered additional support from mall management. Many program organizers have successfully partnered with local hospitals, health care groups and mall management to create walking clubs. Walking may not be perceived as an activity that provides a significant amount of health benefits in comparison to intense workouts; however, it can diminish the risk of colon and breast cancer, and aid with the prevention of osteoporosis, especially for women whose bone loss is a serious challenge post-menopause. 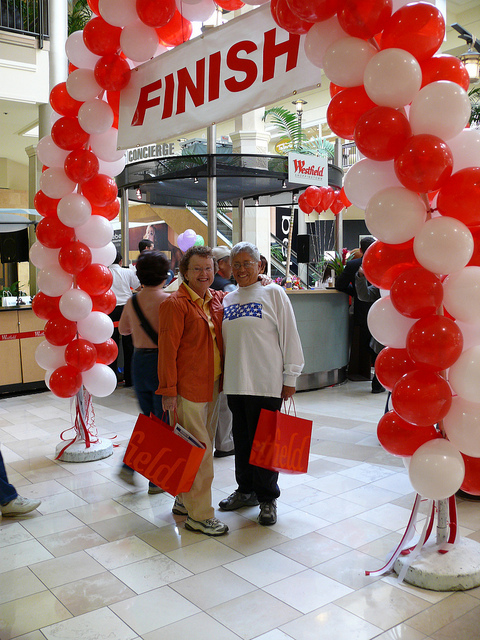 In addition, mall walking allows participants to socialize and meet other walkers, which increases their chances of becoming recurring participants and provides a healthy alternative leading to community building. Some skeptics argue that this is yet another strategy to recruit more patrons to malls, but an article by the Atlantic published last year distinguishes the per dollar amount mall walkers generally spend in comparison to tourists. The article explains that tourists spend approximately $162 per visit, while mall-walking participants consume as little as a cup of coffee. The article asserts that as developers reinvent new mall development concepts, mall-walkers, despite displaying poor consumerist behavior, might be more “in line with their new values.” The article also describes that in the 1960 book titled Shopping Towns USA, the late Victor Gruen, an architect from Vienna who moved to the United States and spawned the shopping mall concept in the 1950s, agreed that malls need “opportunities for social life and recreation in a protected pedestrian environment.” How malls turned out to be developed shocked Gruen because the initial idea was that malls could serve to generate a sense of community in the bleak post-war suburbs. Organized programs that support well-being in creative ways like the mall walkers are highly encouraged by health professionals. In fact, health experts at the CDC agree that physical activity does not need to be of high intensity in order to increase health outcomes. Health benefits are often proportional to the amount of activity; as such, every additional increase in activity provides some benefit. Still, the emphasis on the amount of physical activity performed rather than on its intensity provides a viable exercise option for people who participate in mall walking programs as they are often targeted for older adults who are enthusiastic to incorporate physical activity into their daily lives. Posted on February 19, 2016 January 23, 2017 by njwalksnbikesPosted in Community Engagement, Health, WalkingTagged Bridgewater Commons, Center for Disease Control, demographics, Walking, Willowbrook Mall.